Everyone likes to save money whenever possible, and at All In1 Fun, we like to provide our customers with the best value. That's why we have created a special category dedicated to giving you the best opportunity to get a package deal when you rent from All In1 Fun! Browse the offers below to find just the right package for your event. Please call the office (309)428-7783 to reserve packages. 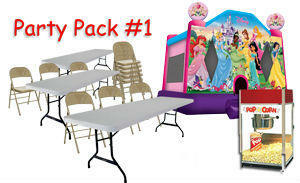 With party package #1 you have a great selection for small backyard birthday party or other modest events. 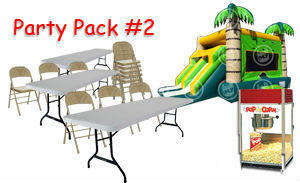 With this option you get your choice of any Regular Bounce House, Pinata, and 3 tables with 18 Chairs.! Large Combo package #1 price= $289. Get even more value with Party Pack #2. With this option you'll get your choice of any Regular Bouncer, Cotton Candy or Snow Cone, Pinata, and 3 Tables with 18 Chairs. Note: The Package Price is only good for this specific combination of product selections and will be reviewed before receiving a reservation confirmation You may add on to your order at normal prices.